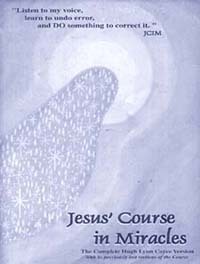 You may actually find this story, of how an ‘early version’ of this course (ACIM) was discovered in 1999, quite interesting. It was this discovery that blew the Course Community wide open! For years, students believed they were studying what the scribes (Helen Schucman and her co-scribe William Thetford) had written, but that was not so. In 1992 the copyright holder started to enforce the copyright stringently and a few years later entered into a multimillion dollar law suit against a spiritual community which was ‘quoting’ the Course out of context. The plaintiffs of the law suit not only included FIP and later FACIM but also included Penguin, which had purchased exclusive use of the copyright in 1995 for five years, paying $3 million dollars to FIP. [This purchase violated the Guidance that had been received by Helen which indicated that only ‘Non-profit organizations’ should handle the matters of the Course.] The spiritual community that was sued had very little funds and were represented only by the lawyers who lived in the community and who offered their services Pro Bono. It was truly a David & Goliath scenario. Of course they were immediately presented with a restraining order and entered into the litigation as well. How Jesus Got His Copyright Back <- This link tells the story of what happened next. Check out our website: CIMS Website.